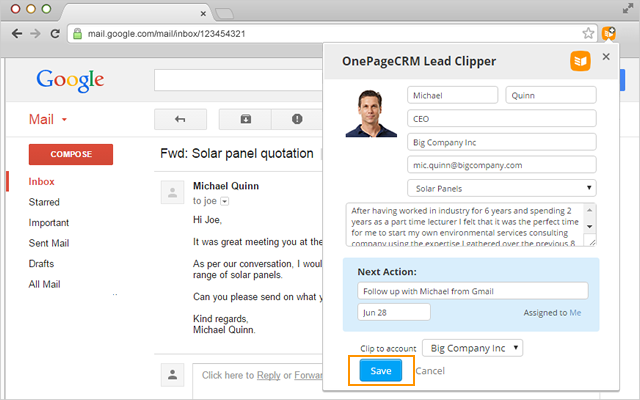 The OnePageCRM Chrome Extension allows you to create contacts in just one click from a profile on Twitter, Facebook & XING or from your mailbox in Gmail, Inbox by Gmail and Outlook.com (including Hotmail & Office 365), switch between multiple OnePageCRM accounts (without the need to log out of your browser) and get browser notifications for time specific Next Actions. In the dialog box that appears, click " Add OnePageCRM Chrome Extension". 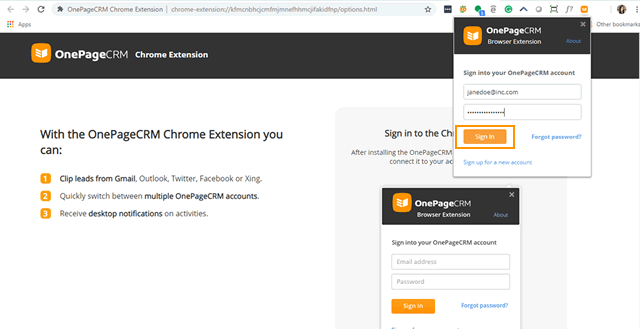 In order to connect it to your account, you must sign into your OnePageCRM account. Note: This is required in order to activate the extension. 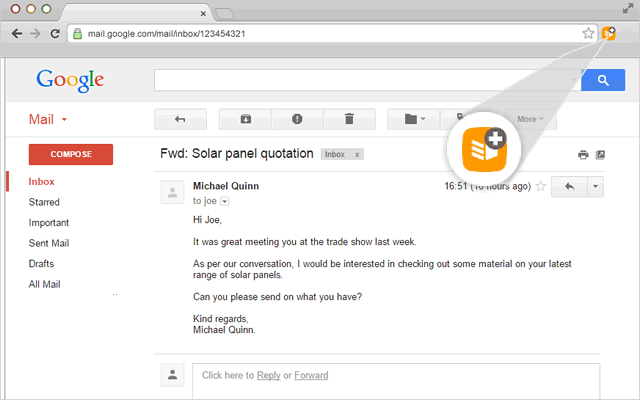 In the pop-up, details of the contact are displayed and enhanced (if available) using the services of Full Contact. You have the option to edit the contact and update the fields, assign an existing OnePageCRM tag or create a new one. Note: A Next Action for this lead is also pre-populated and scheduled for the following day. Click Save to add the contact to OnePageCRM. When the contact is saved, you get a message "Success! Contact added to OnePageCRM". 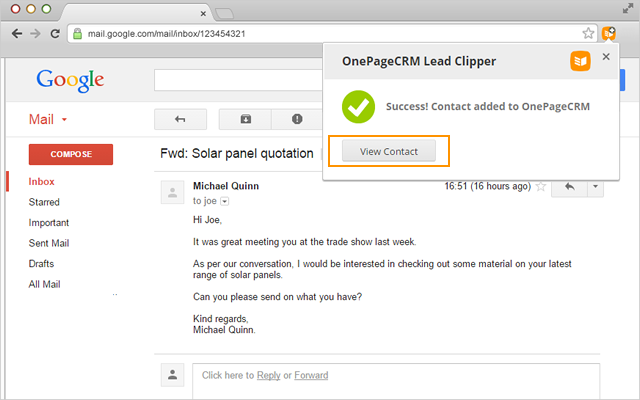 To open the contact in OnePageCRM click on the View Contact button. Once a contact is saved, the OnePageCRM logo will display a tick symbol depicting that the contact already exists in OnePageCRM. 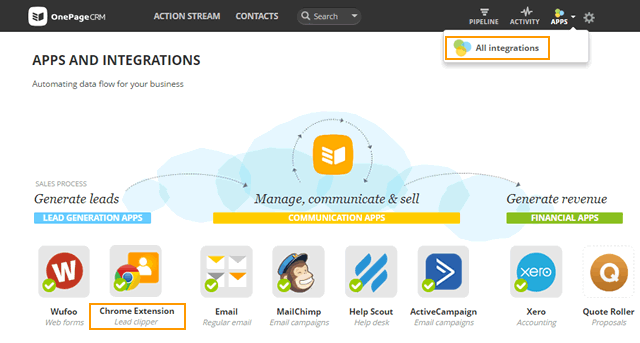 Note: The new contact will appear in your Action Stream as there is a Next Action set by default. Click on the OnePageCRM icon to the top right of Chrome's address bar. To add another company, click +Add Account. Click on the company you wish to switch too. Note: The account listed on top will be the account which you're viewing on screen. To find out more about the Account Switcher, click here. Ensure the Chrome Extension is installed and you are using Chrome. If you have set a Next Action set with a time, the extension will display a pop up to show you when a Next Action is due. (Note: the pop up notification will only display for a few seconds). To set a Next Action with time see here. If you signed up for an account with Google initially, then in order to sign into the OnePageCRM Chrome extension, you must first create a password. 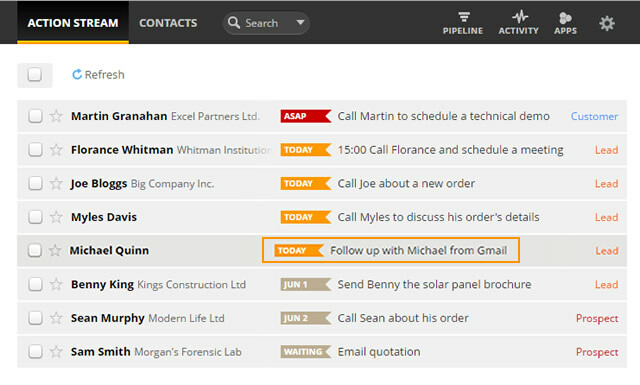 Contacts created from Gmail, Inbox by Gmail, Twitter, Facebook, Outlook.com, Outlook 365, Hotmail and or XING are automatically assigned status "Lead", lead source by default of Gmail,Twitter, Xing or Outlook.com and the owner is the signed in user. 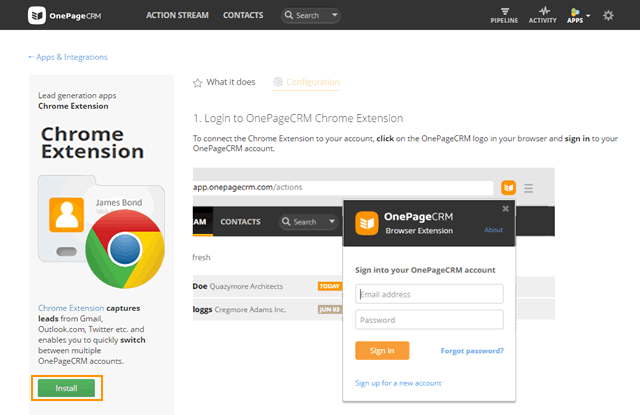 If the contact already exists in OnePageCRM, you have the option to open that contact directly. For uninstall instructions visit this help article.